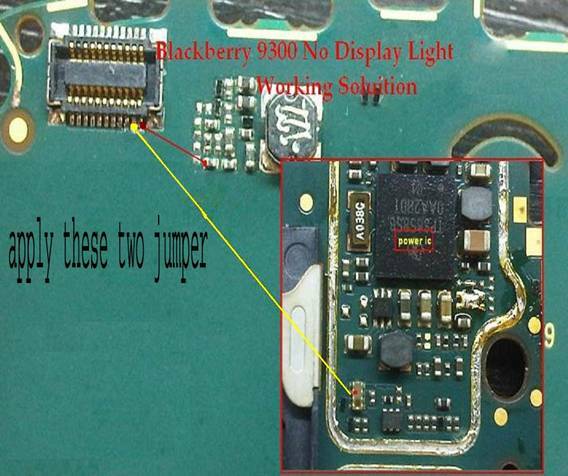 Blackberry 9300 sometime had a strange problem that we can’t see display light on LCD. This problem occurs due to problem in LCD or sometime in LCD IC and track missing from display transistor to LCD connector. 4. After this check line from first point of LCD connector to resistance as shown in image with red line and if line missing there then apply jumper as shown in image in red line. After applying both jumpers we will see proper display light on LCD without any problem. During new LCD change process we should use new and original LCD because local LCD can cause bad result in light.